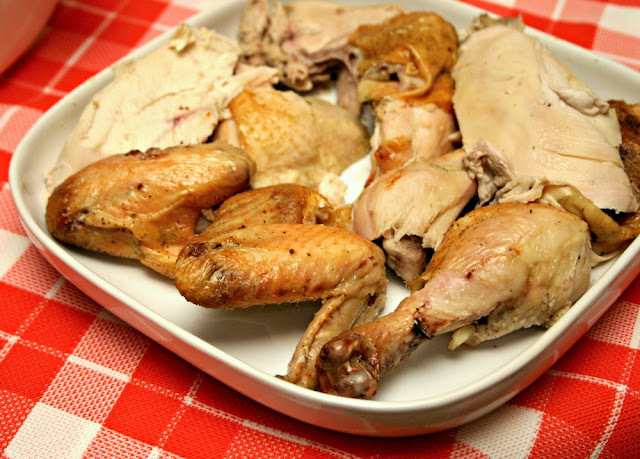 I love roast chicken and, for the longest time, was afraid of attempting to roast them whole at home because I always thought it would be hard for some reason and I would end up with really dry chicken. 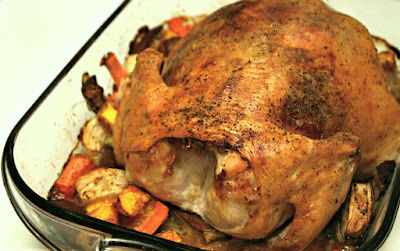 So I just settled for store bought rotisserie chicken and even then, they were sometimes dry or lacking in flavor. 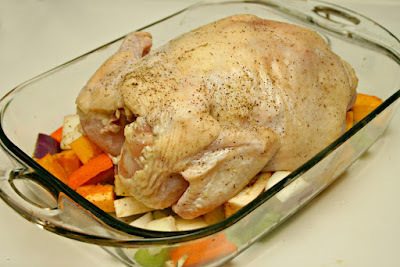 A couple of years back, I watched a cooking show and saw how easy it was to prepare roast chicken at home. I tried it once and have never looked back. 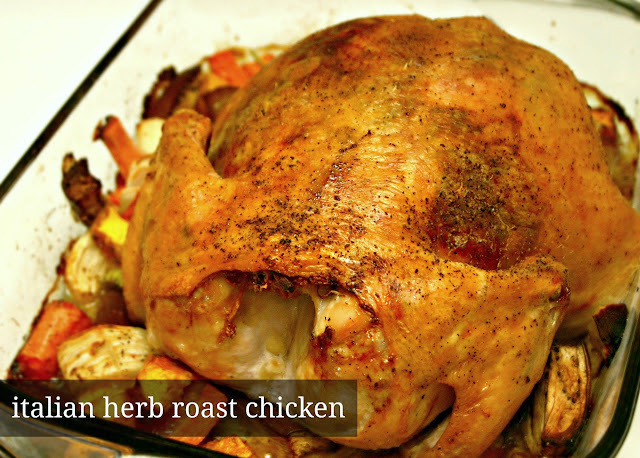 This recipe is now my go-to roast chicken recipe and it produces a flavorful moist chicken every time. My seasoning is different than the one used in the show I watched, but I adopted the technique the chef used at the time -- adding butter under the chicken skin. 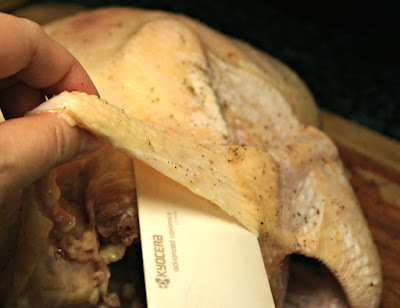 Not only does this technique produce a crisp skin but the butter helps to keep the chicken, especially the breast, moist and juicy. 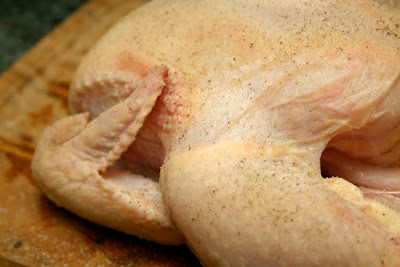 If you've ever roasted a bird, you'll know that the most challenging part is the breast which can easily turn out too dry. 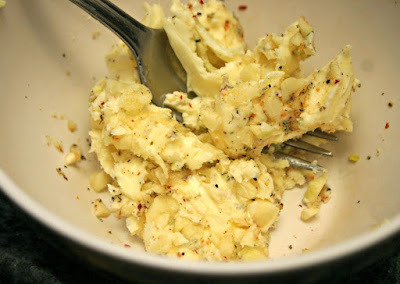 I use a dry Italian herb seasoning mix but you can also use fresh herbs if you have them on hand. 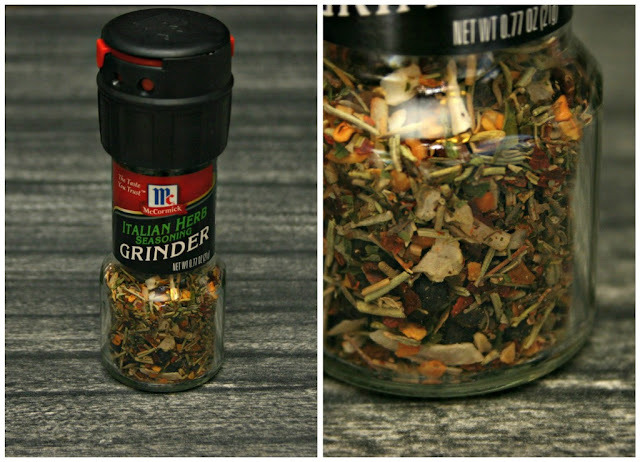 I recently bought McCormick's Italian Herb Seasoning Grinder and, after using it for the first time last night, will no longer go back to pre-ground herb mixes where everything in it is a green flake. You can taste the difference and you can see it too. Check out the photo below. I can see and smell rosemary, oregano, thyme, peppercorn and other herbs and spices. SPICES AND HERBS (INCLUDING ROSEMARY, BLACK PEPPER, AND RED PEPPER), GARLIC, ONION, SEA SALT, TOMATO, AND PARSLEY. The chicken is roasted on top of a bed of vegetables (pick your favorites -- you don't have to stick with my veggie choices), making this basically a one-pan dish. 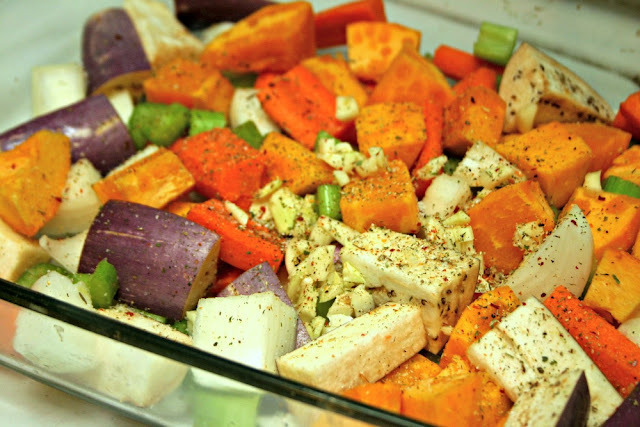 The vegetables will caramelize in the oven and soak up the flavor of the chicken along with the herbs and spices. 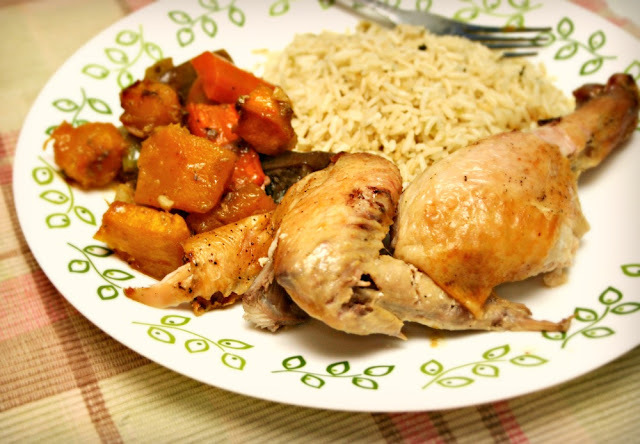 Serve the chicken and vegetables together with rice pilaf like I did and you've got yourself a delicious roast chicken dinner. Serves up to 6 people. a half teaspoon of salt and dashes of pepper. Mix everything together and set aside. cavity, then pat dry with paper towels. and skin at the tail end and around the neck. but I prefer to remove it. It's up to you. Salt and pepper the chicken VERY liberally. Don't skimp on the salt here or your chicken will have no flavor. Be sure to also season the chicken cavity well. and garlic. Mash it all together. the entire skin on the back and most of the legs and thighs. spread it around as evenly as you can. Stuff the cut lemons into the cavity. I usually truss my chicken but I ran out of kitchen string so I didn't truss it this time. 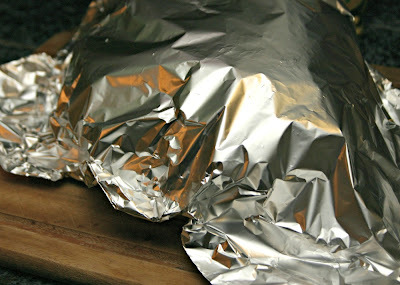 Trussing the chicken is recommended because it helps the chicken cook more evenly. However, not trussing it this time did not really impact me very much. I got lucky and didn't get burnt wings or anything. 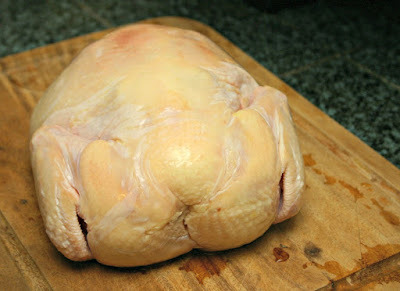 Still, it's good practice to always truss your chicken. 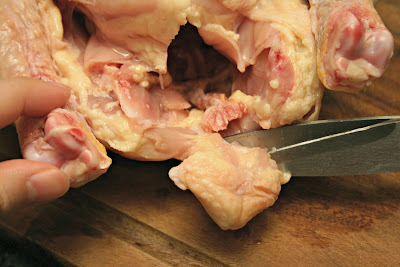 To truss it, simply tie the chicken drumsticks together with some kitchen string or twine and tuck the wings into themselves so that they don't end up being burnt. 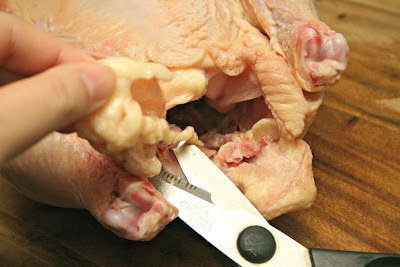 the juices run clear when you cut between a leg and thigh. Beautifully browned after 1-1/2 hours in the oven. The skin is nice and crisp at this point. and allow to rest for about 15 to 20 minutes. 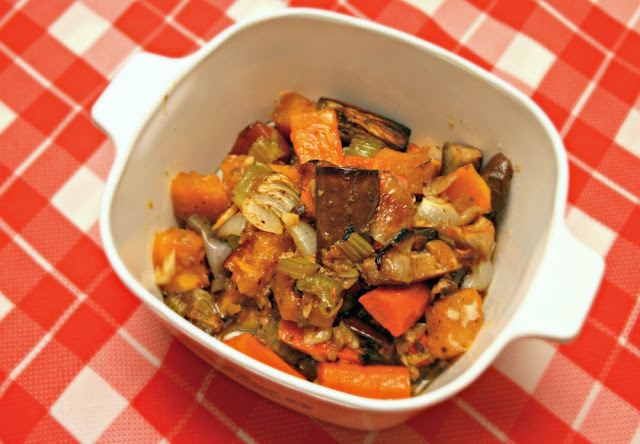 become nicely caramelized and tender. They smell wonderful too. 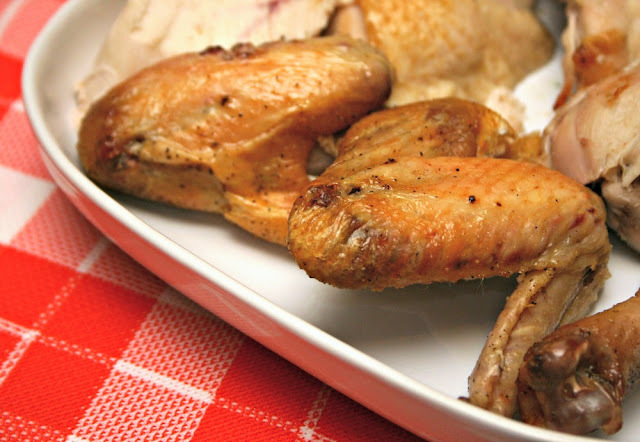 The wings don't have the crunchy skin but they are tender and juicy nonetheless! And dinner is finally served!